In 2009, Vogue decided to respond to the global economic recession by launching its first ever Fashion’s Night Out (FNO). The event was created to not only celebrate fashion, but also to help revive the retail industry. Because FNO’s first year was such a success, Vogue held their second annual FNO in New York City on September 10, 2010. So how does this relate to chef uniforms? 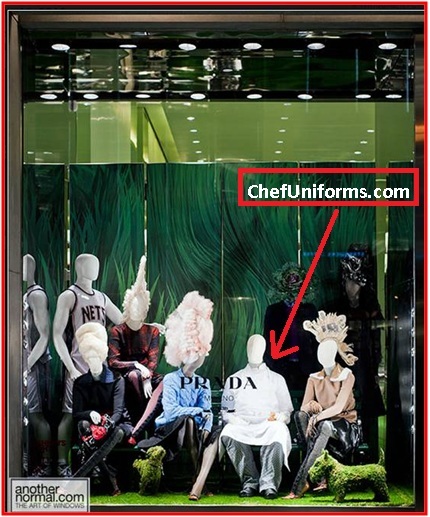 In late August, we received a call from the people at Vogue asking if they could feature our chef uniforms in a photo shoot and Prada’s window display at FNO 2010. Chef uniforms? Fashion? Prada? Who would have thought! Without second guessing ourselves, we agreed to send our ChefUniforms.com chef coats, aprons, hats and pants up to New York for the event. How can you say no to boosting the economy, getting a photo spread in Vogue and being feature at Prada. Below is a snapshot of the window display at the Prada store in NYC. While we aren’t priced nearly as high as clothing from Prada, we look just as good—if we have anything to say about it. So next time you button up your ChefUniforms.com coat, slip on your pants and wrap up your apron, remember uniforms can be a fashion statement too. Just ask Prada. 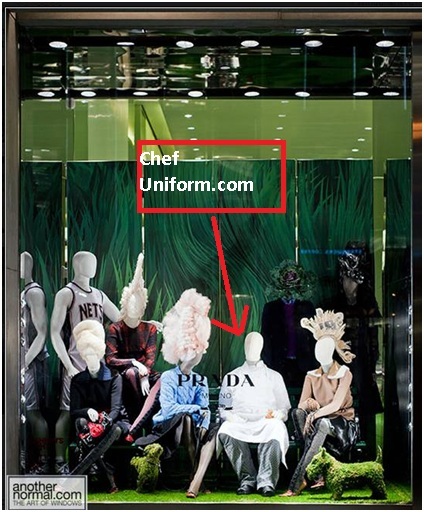 ← ChefUniforms.com was a hit at the NRAEF 2010 Salute to Excellence Gala with its unique, one of a kind designs!